This is a one evening class from 5:00pm to 7:30pm that will cover all the Core Classes. Discover - Learn about the vision and values of Calvary. Grow - Learn how to grow spiritually and identify your next steps. Serve - Learn how God cratd each of us to make a difference in your home, city and world. Commit - Learn about Calvary's core beliefs and commitment of membership. We hope you and your family will join us for Easter services on Sunday, April 21, at either 9:00 or 10:30 am. We’ll gather for vibrant worship, and a relevant, hope-filled message. Childcare for pre-K will be provided. A night to remember with dancing, fun activities, food, and more! Gather with us to celebrate the birth of Christ, enjoy meeting some new people and eating delicious desserts! Doors open at 6:30 pm and event starts at 7:00 pm, at the West Campus. Help us share with others. Please bring a non-perishable food item. Members of Calvary Church 18 years and older will vote on the 2019 proposed budget and nominees to the Elder Board. Worship the Lord with Thanksgiving. We’ll gather as a church family to give thanks and enjoy dinner at the Annual Night of Worship. We’ll provide the turkey. Please bring a side dish or dessert to share. Jesus recognized that the different people he encountered were at different stages of growth and development, and he worked to challenge each of them to move to the next level. In this 4 Chair Discipling Seminar for men and women, you will get a clear picture of how to follow in Jesus' footsteps and do the same. Families, please invite your friends and neighbors and their kids to join you for church! Kids in grades K-5 will have a great time at Kids' Extravaganza. There's gonna be fun! There's gonna be teaching! And it might get a little messy! No registration required. Just show up and check in your kids! Women from all campuses are invited to join us for an evening of worshiping God and celebrating friendships with others. Get a photo with your BFFs at the photo booth. Prayer Counselors will be available. Winshape Camps will be the Best Week Ever for kids who have completed grades 1 through 9. Winshape provides a professionally trained staff and combines sports, recreation, arts, Bible study and worship to help create the most meaningful, unforgettable and fun-filled day camp experience you'll find anywhere! We're gathering our campuses together for one giant night of worshiping together! This is one of those not-to-be-missed events. Don't miss the after party with free treats from Kona Ice trucks! This watch live, visit our Facebook page or calvary.church/live. Baptism by water immersion symbolizes the death, burial, and resurrection of Jesus. Baptism does not save you, but rather is a public declaration that you have placed your faith in Christ as your Savior. And while baptism is not required for salvation, it is a biblical command and demonstrates your love and obedience to Christ. Mom this is your chance to have a date with that very special "little" man in your life. On April 20th, 2018 from 6:30 - 8:30 pm we will have our very First Mother Son Date Night. Wear comfy clothes for an active evening of fun, food...and maybe a little mess. Join us each Monday at 5:00 for friendly competition. We play at InCline Village in Foristell starting April 9. We will not play on holidays. Season ends August 27. Join us for Easter services at 9:00 or 10:30 am. Refreshments served. Childcare provided infant through pre-K.
Calvary's church family from all three campuses will gather together at the Mid Rivers Campus in remembrance of Christ's sacrifice upon the cross. Together we will worship, pray, and share communion. Childcare available for infant through pre-K.
Bring the family and join us for an Easter Egg Hunt, face-painting, bounce houses, free snacks, games and more! Dress up, show up, and dance the night away with your daughter(s)! You and your date will enjoy refreshments and fun activities. Best of all...you'll make lasting memories with your precious girl. Cost is $10 for Dad and $10 for Daughter, with a family cap of $25. Bring your kids, bring your snacks, bring blankets or lounge chairs if you like! We’ll hang out and watch the fun, family-friendly movie Trolls. Merry Christmas! Join us as we celebrate the birth of our Savior. The Christmas Dessert Gala is a great opportunity to invite your friends, family, co-workers who don't normally attend church to join you for an evening of Christmas music, decadent desserts and beautifully-decorated tables. Join us for a potluck dinner and an evening of thankful praise and worship. 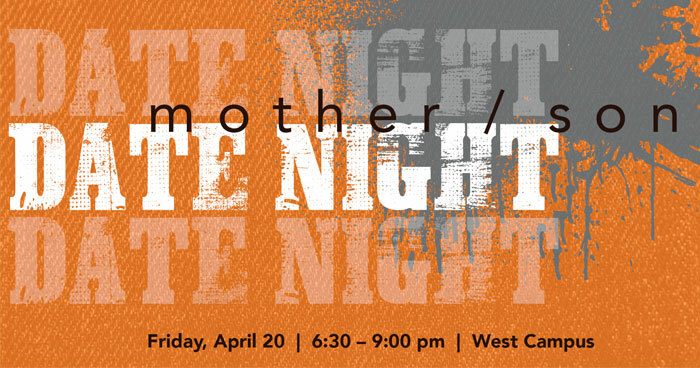 Middle School and High School Students from all 3 campuses will gather for a night of worship at West Campus.